Congratulations ladies! To claim your prize, please contact me with your full name and address by November 13, 2013 or you will forfeit your prize! Shipment of print books to US and UK addresses only; digital copies internationally. Thanks to all who left comments and to author Monica Fairview for her guest blog and the giveaway copies. « Project Darcy Book Launch & Blog Tour with Author Jane Odiwe & Giveaways! Carol, Maggie, Jenny, Irene, Eanayray, Jo Clare: Congratulations to all of you. Hope you enjoy reading Steampunk Darcy! Dear Monica, thank you! I just love the cover and am delighted to have the physical copy of your book and am excited to read this new-to-me genre! Thank you so much for this giveaway opportunity! I can’t wait to read this new P&P alternative. 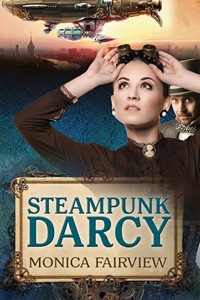 Thank you so much for a digital copy of “Steampunk Darcy”. I can’t wait to read it!